Pack a powerful workout in a space-saving design with the Slim Folding Motorized Treadmill by Asuna. Supporting up to 220lbs, this running deck (49Lx17.5W) has shock absorption technology that reduces impact on your joints when you exercise. Take advantage of the 2.5-peak horsepower motor on the indoor treadmill, which can support walking and running speeds between 0.6mph and 8mph. Use the 4-window display on the treadmill to visualize your workout performance. Keep track of distance, time, calories burned, and speed at a glance. Make quick adjustments to speed by using the on-console quick buttons. And take advantage of the built-in pedometer to monitor your total steps during your exercise sessions. Mount your favorite smart device on the treadmill with the on-console tablet holder. Bump up your workout with your favorite tunes when you connect your music player to the onboard MP3 sound system. Use the included folding tool to securely fold and unfold the treadmill in the instant. Designed with portability in mind, use the transportation wheels to move the treadmill, and store the motorized treadmill under raised surfaces. Use the folding tool that’s located on the base of the treadmill to fold the treadmill flat (measuring 64L x 30.5W x 4.5H inches when folded flat) and lock the frame in place. EASY-TO-USE DISPLAY: Watch your workout progress in real time with the 4-window display. View your time, distance, speed, and calories burned all at the same time. Use the integrated pedometer to track your steps during each exercise session. ULTRA-PORTABLE DESIGN: This running treadmill can be easily and securely folded flat with the included folding key. Take advantage of the low-profile design, which makes it easy to slide the machine under surfaces and move it from room to room. FOLDING TOOL: Turn the tool counterclockwise in the frame locks to fold the treadmill frame. After it is folded, use the treadmill key to secure the frame in place. Keep the tool handy by placing it in its dedicated slot at the base of the treadmill. 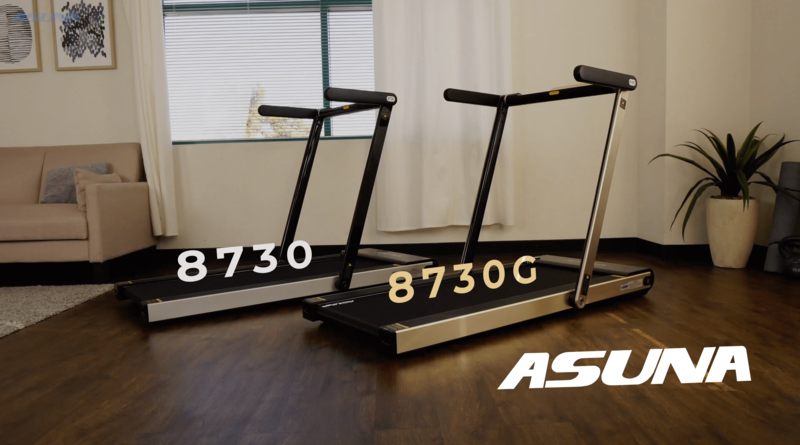 STURDY BUILD: This treadmill supports a maximum user weight of 220lbs. Reduce impact on your joints as you walk or run when you strike against the shock-absorption-equipped running deck, compared to exercising on concrete or other hard surfaces. POWERFUL MOTOR: This treadmill is powered by a 2.5-peak horsepower motor that supports speeds from 0.6mph to 8mph. Change your speed in an instant with the on-console quick buttons. VERSATILE TRANSPORTATION WHEELS: This indoor treadmill has two sets of transportation wheels that allow you to move it forward, backward, left, and right when it’s folded flat. This makes it easier to move, position, and store the treadmill when it is not in use.